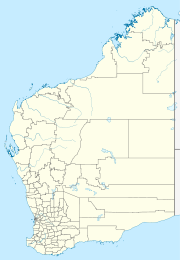 Bondini is a small Aboriginal community, located 10 km east of Wiluna in the Mid West Region of Western Australia, within the Shire of Wiluna. In the 2001 census, Bondini had a population of 105, consisting of 102 Aboriginal and Torres Strait Islander people. The community is located within the determination area of the Wiluna (WAD6164/1998, WAD248/2007, WAS181/2012) Native Title claim area. Bondini is not represented by an Incorporated Community Council. As a replacement the community is semi represented by the Mid-west Employment Education Development Aboriginal Corporation. Bondini Layout Plan No.1 has been prepared in accordance with State Planning Policy 3.2 Aboriginal Settlements. Layout Plan No.1 was endorsed by the community on 8 August 2012, and by the Western Australian Planning Commission (WAPC) on 24 February 2004. The Layout Plan map-set and background report can be viewed at Planning Western Australia official site. This page was last edited on 12 February 2018, at 14:42 (UTC).